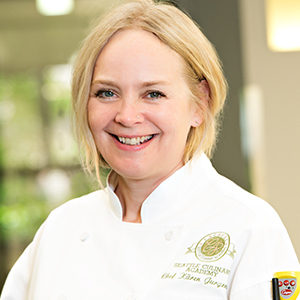 Kären Jurgensen, Chef Instructor at Seattle Culinary Academy; Slow Food Seattle Advisory Council Member; and Slow Food Chefs Alliance Leader. The Slow Food Chefs' Alliance is a network uniting chefs around the world who are committed to defending and celebrating biodiversity, food traditions, local cultures, and artisanal food producers. Chefs have a fundamental role to play in safeguarding the biological and cultural diversity of our food. They interpret the histories and ecosystems of their regions with skill and creativity, supporting local producers while awakening eaters to the role we all play as custodians of biodiversity. To give chefs an opportunity to learn from each other and support each other in utilizing their kitchens and menus to change the food system for the better. To inspire the creation and strengthening of direct relationships between producers and chefs, with the result of collaboration, friendship, and solidarity. To develop and strengthen the Slow Food network by bringing diners, producers, and restaurateurs into the network. To participate and support Slow Food events and campaigns. Further the objectives of the Alliance. Participate in Chefs' Alliance campaigns and events. Use and promote “good, clean, fair” products, especially foods from the Ark of Taste and Presidia that promote biodiversity. Respect the seasonality of ingredients when creating a menu. Indicate that s/he is a member of the Chefs' Alliance in way that is easily evident to restaurant guests. Advocate for working conditions that respect the rights of all restaurant workers and the payment of fair prices to producers. If you would like to take part on a local level, contact us at info@slowfoodseattle.org.